Are Meat Grinders from Weston Good? How is Weston better than other brands? What I like and dislike about Weston meat grinder? If you make a list of top 10 meat grinder manufacturers, Weston will be there for sure. We have previously reviewed STX meat grinder and LEM meat grinders. After getting a positive response from the readers, we have decided to review the Weston meat grinders too. If you are going to buy any meat grinder soon, you should read this Weston meat grinder reviews first. Meat grinders from Weston Supply are among the best ones that are available today. They offer the best quality products that can cater to all your meat grinding demands at home as well as your catering outlet. According to Weston Supply, they have been empowering their esteemed consumers to truly reconnect with food. You not only get actual value for money but can also get your meat processing work done in just seconds. Weston meat grinders can chop meat pieces of varying sizes without the slightest hassle. The brand Weston is instrumental in bringing out its best innovation in products. If you are looking for a quality meat grinding machine from Weston then choose the Weston Pro Series 22 Meat Grinders. In spite of the numerous other meat grinding machines available today, there are certain distinctive characteristics that make Weston meat grinders truly among the best. Weston meat grinders always try to improve their speed and performance in every aspect. The upgraded speed is to complete the whole task of grinding, in half the time as compared to other grinders available in the market. The advanced technologies made used in the manufacturing of these grinders are, a step ahead, from the conventional meat grinders. Apart from high-quality meat grinding, Weston also offers you easily maintained products that make your food preparation process safe and healthy. Moreover, all the parts are manufactured out of the best quality of materials that are approved by the relevant governing authorities. Weston Electric meat grinders are known for their sturdiness and durability. They are well formulated with all high-ranking and prevailing equipment that stands foremost in the list. Weston products come with metal gears with roller bearings and lubricated efficient motors that reduce the running noise while the machine works. 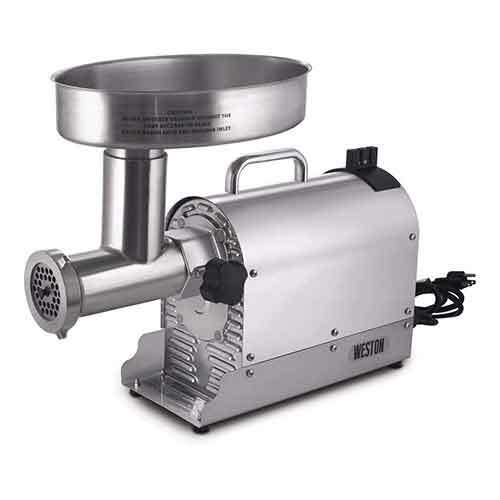 The Weston Meat Grinding Products are meant for both small and heavy duty grinding of meats. So along with commercial meat grinder from this brand, you will also get meat choppers for your use at home. Weston Electric Meat grinders are more versatile to mince meats of beef, deer, elk, pig, and also chicken. With these kitchen appliances, you could make home-made sausages easily. Now that you have already become familiar with the meat grinders from Weston Supply, it is time to check out the positives and negatives, in order to arrive at a decision. So to wrap up and lead you to decisive thinking, Weston does provide high-quality electric meat grinders. As far as the costing issues, it is just a one-time investment for your kitchen needs. Apart from this, there is no more expenditure that you have to bear. If you think, packed and processed minced meat foods are considered very expensive, but when you can prepare the same in the comfort of your kitchen using the Weston meat grinder, it will be totally worth the price. Not to mention considerably more hygienic and safe. So, we hope choosing the most effective meat grinding machine is now easy for you after this review. You already know which one to look for in the market.